And as you might guess from its name, the program can then keep them up-to-date. Just click "(Re)check Folder" and Updater will compare the contents of your folder with the Sysinternals site, downloading any new or modified tools for you. It's all very straightforward, and if you're familiar with the Sysinternals range then you may not need anything else. If you'd like a little more help, though, it may be worth trying WSCC (the Windows System Control Center), instead. This not only downloads and updates Sysinternals tools, but also provides a GUI for them. The utilities are organized into categories like "File and Disk," "Network" or "Process," helping you find what you need, and even the command line tools can be launched at a click for instant testing. Better still, WSCC works with NirSoft, as well as Sysinternals programs, giving you speedy access to more than 220 of the best free tools around. And so whether you're trying to equip a new PC with useful utilities, or just need to diagnose an existing problem, there are few easier ways to get some top quality assistance. 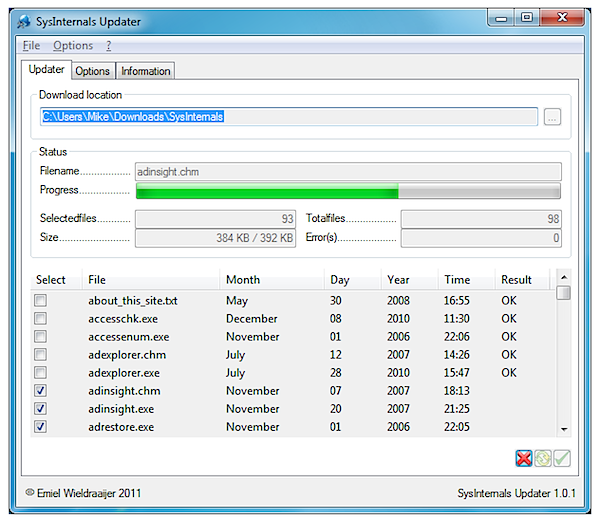 Download the Sysinternals Updater from the review page. Get more great tips like this one at Software Crew.